For the better part of the previous three months we had been exploring how to put housing on this site—the last to be developed at University Park @ MIT. While working previously at Koetter Kim, the firm that did the master plan, we had looked at a variety of programs, including a market/retail building, a movie theater, and an office building. Now that the development agreement Forest City had negotiated with MIT in the mid 1980s was coming to an end, Forest City needed to develop the parcel or it would revert back to MIT and housing was the only option that was feasible in the market at the time. The site was prominently located one block south of Mass Ave. near the Central Square Fire Station and was the symbolic entrance to the entire University Park development. The site was at the entry of a billion and a half worth of real estate. We couldn’t leave the front door vacant. You remember we were coming to the end of our agreement with MIT. We only had 50,000 square feet left, so it was a tough set of economics. We agreed to spend an extra amount of money because it was the front door. The master plan was permitted with a set of design guidelines that offered some flexibility in heights and uses but there was a cap on the total allowed square footage. The development had been built out over a twenty year period, and this last parcel got the “leftovers”– only 50,000 square feet. The design guidelines governed not only materials and building heights, but also prescribed that the buildings hold the urban street edge. We had test-fit multiple configurations, ranging from flats and town houses to courtyard buildings, but the dimensions of the site (roughly 200’ x 100’) did not suit any “normal” prototype particularly well. 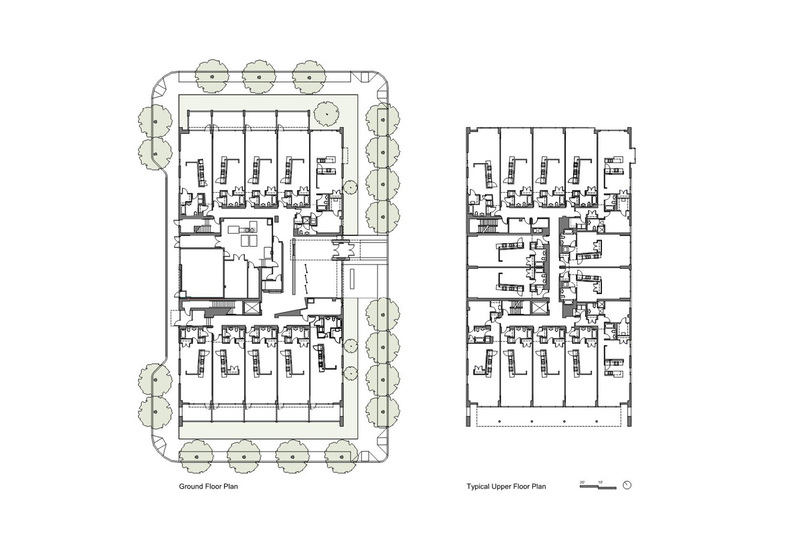 The typical double-loaded corridor housing solution would result in a 60’ wide building, leaving substantial setbacks and not filling up the block per the guidelines. Urbanistically, the building also needed a more substantial height than the typical apartment building in order to hold its own on this prominent site. So the prospect of doing something really different seemed more and more probable as the investigations continued. While at Koetter Kim, we had designed 91 Sidney Street, the 10-story apartment building on the opposite end of the University Park Common. We learned from the building’s lease up that the units that rented first were the ones facing the park. 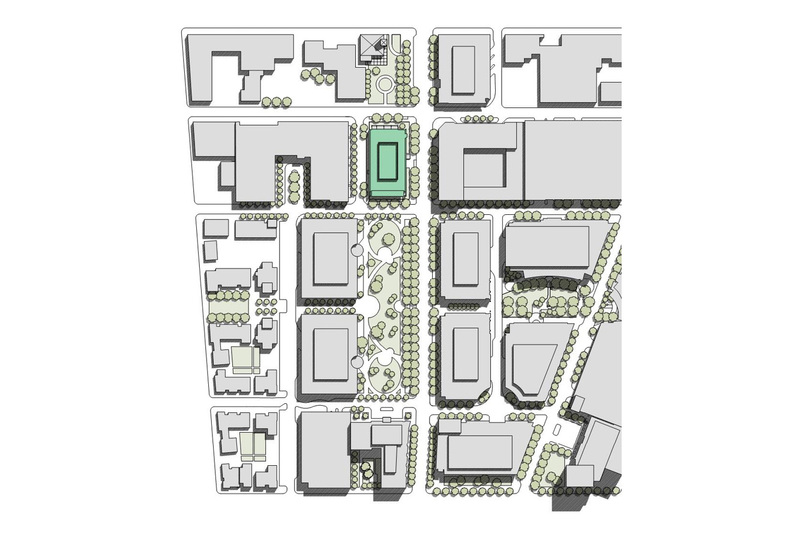 Since our site was between two parks—the Common to the south and the smaller Market Square Park to the north, we took the developer’s perspective and conceptualized how to get as many units as possible facing the parks. I often get ideas while away from the office doing other things and this mental math of a unit width coalesced in my head-12 foot bedroom, 2 feet for the kitchen cabinets, and a four foot corridor. This totaled 18 feet, an unorthodox unit width which would allow five units facing the park so 40 of the 50 units would have park views. I came in the next day and described it Kenneth and by the end of the day, he had a plan that proved the viability of the idea. Several key ideas began to crystallize at this point which were critical to the building’s uniqueness and success. We developed a very long and narrow apartment unit (45’ x 18’) per the mental math which maximized the units with park views. And these deep units also ran perpendicular to the end units at the center of the building, extending the building volume out to the street per the guidelines. 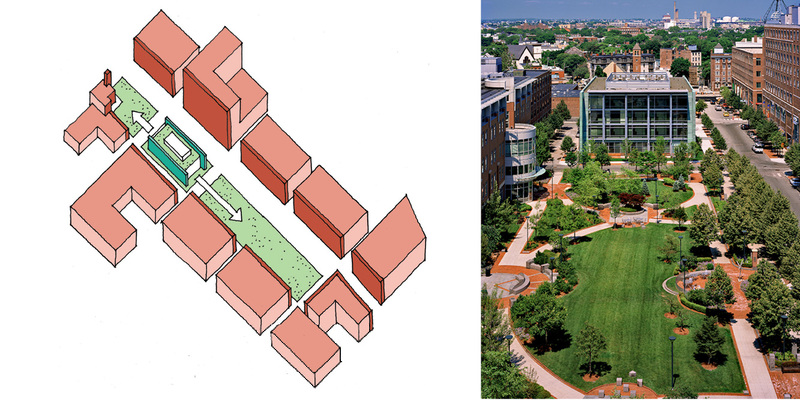 The extra ten feet would allow a landscape buffer to slide by the building suggesting that the building could be “in the park” and not just fronting on it. In order to give the building more height, we conceived the floor-to-floor height as 12 feet which gave the units a loft-like feel. At this time, most loft units in the market were condominiums for sale and the owners were expected to outfit them with kitchens, storage units, etc. to make them livable. The units we were designing were to be for lease, so we needed to provide all of the components for the renters. We organized the deep (and now tall) unit with living area out near the windows to get the view and the bedroom area inboard, with “borrowed” natural light over a partial height wall that also supported a linear kitchen. To enhance the loft aesthetic, we looked to using durable materials that were largely exposed, typical of the brick and wood beam loft spaces one would find in turn of the century warehouse or manufacturing spaces. In a steel framed building, this meant concrete floors and exposed metal deck ceilings. The concrete floors were installed as a topping slab, floating on an acoustic isolation underlayment. This provided enough acoustic separation as not to need a dropped ceiling in the units and also saves the developer from having to replace carpets when units turn over. The systems infrastructure in the units was also left exposed, including vertical plumbing risers, branch sprinkler pipes and spiral ductwork. Typical apartments with exposed materials, high ceilings and generous views to the parks. The building exterior design did not come immediately. It was clear that the ends of the building facing the parks should have as much glass as possible, but it made sense that the long ends of the building be more screened, since the adjacent properties were a hotel and another apartment building. We hit upon the idea of the gardens passing through the building (diagram below) expressing the transparency held by two walls. The question was how to make the walls? 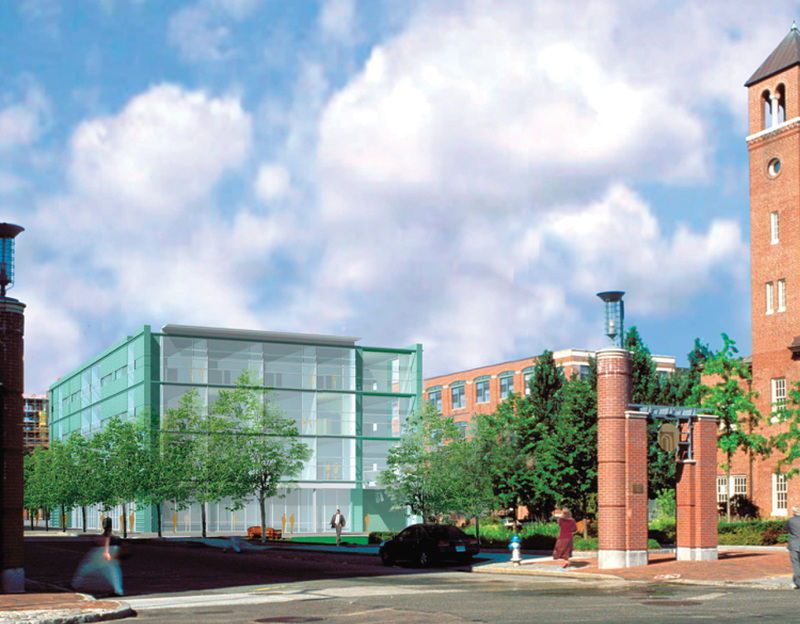 Early concept rendering showing the pre-patinated copper in the brick context. In the office, Frank DiMella was constantly challenging the design, “Does your client really want to build this? How can you justify such a radical approach? Copper? Too expensive.” As an expert at multi-family housing, he knew how many of the “rules” we were breaking and was concerned about failure, but trusted me to make the final decision. I came to realize that it was my time to step forward and be the decision maker as to when it was good enough. Using all that I and my team had learned from working with Frank and Rem, Fred Koetter and Michael McKinnell, we continued to move forward as the design decisions seemed to reinforce each other, making the concept stronger. Presenting this design to the Cambridge Planning Board was also a challenge. The diagram above got them to understand the concept right away, but they had concerns. One thought “it was look at me architecture” which couldn’t have been further from the conception of it. Fortunately, the development guidelines as they had played out over previous 20 years, had become a little predictable in their own right and the architects on the board argued that the material choices were carefully considered and appropriate in the context. The chairman, a lawyer by training was the last to speak, “Mr. Hodges that is a really green building…..” He didn’t mean sustainable, he meant strange in an Incredible Hulk or Kermit the Frog kind of way. “….. I hope you know what you are doing,” and he voted in favor of it. The copper side walls run past the end of the building on the south, like blinders on a horse, focusing the view on the Common. The last hurdle was Forest City’s Investment Committee from which the development team needs to get internal approval. This step is totally out of our control because we are not even there. We knew Ron Ratner was a supporter, but had no real knowledge of how the committee worked. John Weigel, the development Project Manager reported back that there was skepticism about anyone wanting to live in such a building, but in the end, with only 51 units, “we could not possibly lose enough money to sink the company and maybe you can find 51 people who would want to live there. The market has embraced Loft 23 and it consistently commands some of the highest per square foot rents in Cambridge. In fact, the managers tell us that people rent a one bedroom to wait for one of the corner two bedrooms to become available. It was a risk to break a lot of the typical market rate housing “rules” here—unique unit design concept, increased floor-to-floor heights, exposed materials and systems and an exterior copper cladding. These decisions were not made for the sake of being different, but were backed by cost logic. We traded the cost of finishes and interior doors for height and at the time the copper façade was cheaper than a brick cavity wall on a per square foot basis. Slate and mahogany are used as accents to the copper. Ron Ratner understood from the early studies if we didn’t break the rules, we wouldn’t be taking full advantage of the site. Ten years after the opening, I asked Ron recently about how he thought the building had performed and would fare over time. Here, we let design take a lead position which we wouldn’t normally do. Where we have raised our game, it has generally paid off, such as at Loft23 or at the Gehry tower in New York. 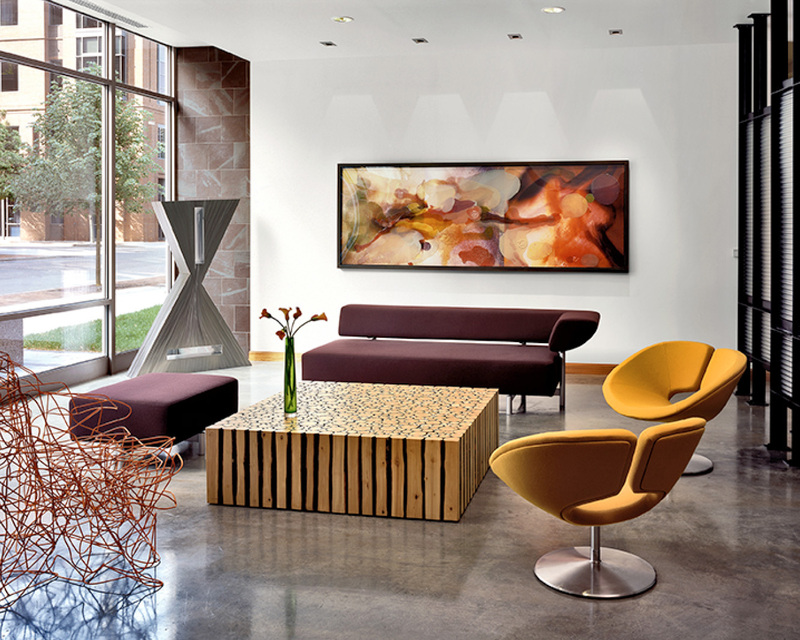 The entrance lobby takes on the character of a modern furniture showroom. You can forget, in such a parade of competing pizzazz, just how satisfying a work of plain old-fashioned modernism can be. Twenty-three Sidney reminds us that modernism was and remains one of the great architectural styles. I am relaxing now; what a great feeling! He would go on to name it one of the ten best buildings for 2005 in his year end article. 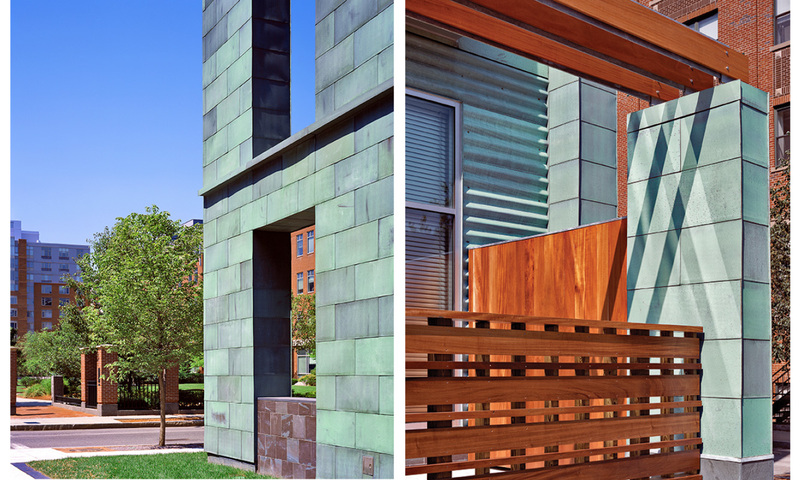 The Boston Society of Architects would award it in 2006 with both a Housing Award and an Honor Award for Design Excellence which was the icing on the cake. The project was born out of the constraints and led to so many positive things for the firm and most importantly our client for whom the building continues to deliver returns. We all understand that fear can drive you to accomplish great things. To try and come up with something new for a company that owns 40,000 apartments is led by someone who has been in the multi-family business for 30 years and is trained as an architect was a daunting challenge. In spite of all the positive outcomes on this project, the phrase “Bring me something I haven’t seen before” still scares the hell out of me.